Chapter 1: Herding in Middle Eastern Frontier Markets: Are Local and Global Factors Important? 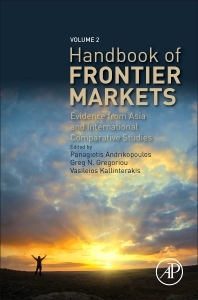 Chapter 5: Are Frontier Markets Worth the Risk? Chapter 10: Stock Index Return Predictability in Frontier Markets: Is It There? Chapter 12: Is Quality Investing Feasible in Frontier Markets Based on Publicly Available Financial Information? Chapter 13: Frontier Market Investing: What’s the Value Add? Dr. Panagiotis Andrikopoulos is the Associate Head for Applied Research at Coventry University Business School, University of Coventry. He is also an Adjunct Associate Professor in Finance in the School of Accounting Sciences at North-West University, South Africa. He has also lectured at De Montfort University, UK where he taught various finance courses such as Investment Theory and Analysis, Finance Theory, Corporate Finance, and Behavioural Finance. He has obtained his Ph.D. in finance at the University of Portsmouth studying the profitability of contrarian investments strategies in the U.K. setting. A native of Montreal, Professor Greg N. Gregoriou obtained his joint Ph.D. in finance at the University of Quebec at Montreal which merges the resources of Montreal's four major universities McGill, Concordia, UQAM and HEC. Professor Gregoriou is Professor of Finance at State University of New York (Plattsburgh) and has taught a variety of finance courses such as Alternative Investments, International Finance, Money and Capital Markets, Portfolio Management, and Corporate Finance. He has also lectured at the University of Vermont, Universidad de Navarra and at the University of Quebec at Montreal. Professor Gregoriou has published 50 books, 65 refereed publications in peer-reviewed journals and 24 book chapters since his arrival at SUNY Plattsburgh in August 2003. Professor Gregoriou's books have been published by McGraw-Hill, John Wiley & Sons, Elsevier-Butterworth/Heinemann, Taylor and Francis/CRC Press, Palgrave-MacMillan and Risk Books. Four of his books have been translated into Chinese and Russian. His academic articles have appeared in well-known peer-reviewed journals such as the Review of Asset Pricing Studies, Journal of Portfolio Management, Journal of Futures Markets, European Journal of Operational Research, Annals of Operations Research, Computers and Operations Research, etc. Professor Gregoriou is the derivatives editor and editorial board member for the Journal of Asset Management as well as editorial board member for the Journal of Wealth Management, the Journal of Risk Management in Financial Institutions, Market Integrity, IEB International Journal of Finance, and the Brazilian Business Review. Professor Gregoriou's interests focus on hedge funds, funds of funds, commodity trading advisors, managed futures, venture capital and private equity. He has also been quoted several times in the New York Times, Barron's, the Financial Times of London, Le Temps (Geneva), Les Echos (Paris) and L'Observateur de Monaco. He has done consulting work for numerous clients and investment firms in Montreal. He is a part-time lecturer in finance at McGill University, an advisory member of the Markets and Services Research Centre at Edith Cowan University in Joondalup (Australia), a senior advisor to the Ferrell Asset Management Group in Singapore and a research associate with the University of Quebec at Montreal's CDP Capital Chair in Portfolio Management. He is on the advisory board of the Research Center for Operations and Productivity Management at the University of Science and Technology (Management School) in Hefei, Anhui, China. Dr. Vasileios (Bill) Kallinterakis is currently Lecturer of Finance at the University of Liverpool Management School; he has also lectured at Durham University Business School (from where he also obtained his PhD) and Leeds University Business School. During his career, he has taught a variety of courses related to Behavioural Finance, Corporate Finance and Econometrics. His research interests focus on behavioural finance, institutional investors, market volatility and emerging markets.